Armed with FEARLESS PREGNANCY: Wisdom and Reassurance from a Doctor, a Midwife, and a Mom women who are newly pregnant or planning to become pregnant can rest easy with the most up-to-date information and facts from the experts to aid them through the process. Mom and writer Victoria Clayton deals with the often-unspoken fears that plague pregnant women everywhere. She also enlists the advice of Stuart Fischbein, M.D., F.A.C.O.G and certified nurse-midwife Joyce Weckl, M.S.N., C.N.M. to answer questions about common health fears from the early days straight through delivery and beyond. 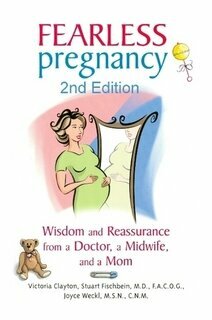 Most pregnancy books seem designed to create fear and unnecessary stress by citing all that could go wrong. Not this book—it will give the expecting mother a positive outlet for the inevitable fears so that they will feel excited and calm during their pregnancy.